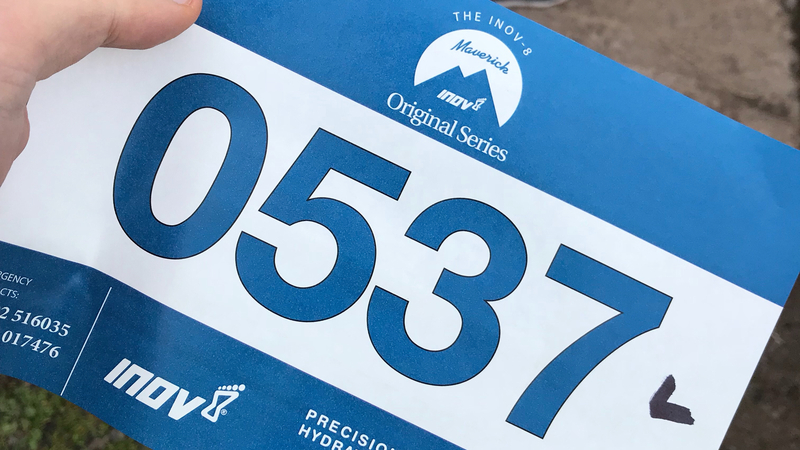 Maverick Race’s inov-8 Original Somerset would be my third outing under the black and white arch. My first was one of the original Originals – West Sussex, where I came close to succumbing to heat exhaustion (click the link above to find out why). The second was the Hampshire round of the Dark Series, where I ran in fear and showed how not to run a night race……. What would happen on the 3rd attempt? I’d never run in Somerset before, and had no idea what or where the Quantock Hills were. Given the course profile, could this really be where the race was organised? The months of 2018 have been frustrating on the whole. I’ve spent as much time on the side lines as I have running, with a succession of colds/high temperatures/illness. I’ve logged good weeks and strong sessions, only to be left sitting idly by as others progressed. What it forced me to do, was to make the most of the time I had and recover. Thankfully, my turn in health coincided with my coach, Paul Giblin’s, first Pyllon Experience training camp and this catapulted me to an early start, departing Milton Keynes at the social time of 0530, hitting the road on the long drive down to Somerset. Fueled by Break Fluid and listening to podcasts, I’ve never made a bagel and malt loaf section last so long, trying to hold off my hunger, whilst steering clear of consuming my body weight in carbs before a hard run. The event village had music beckoning everyone to leave the comfort of their cars and on to registration. I’d received a note from Paul the night before & I intended to run to his simple message (for my eyes only). Two gels & a collapsible cup in a small waist pack, route set into my watch. 3,2,1 and we were heading out of the start arch, with all 3 race distances combined. I was to run the Long race, some 13.7 miles and 650m+ of ascent. As we turned out of the straight and onto the course, the first climb stood before us, as the leaders disappeared quickly and would remain out of sight for the remainder of the day. RD Ben’s words of taking the first climb steady rang out in my ears, as despite only moving hundreds of meters, I found myself looking to hold onto the position I had….. foolish. As the steep road gave way to trail, the not muddy course began to show signs of not quite running true, as my lightly treaded shoes squirmed on the first deep section. I’d run around the fringes, avoiding any deep sections, even if it meant squirrelling a long an off camber section, chucking me onto the other side of the trail eventually. And then it got wet. After a rapid descent on a rocky, hard packed, flowing single track, the stream crossings started. They didn’t relent. Taking constant decisions whether to leap, jump or push on straight through them, the crystal clear water flowed fast enough to inhibit clear sight of the rocks below. Breaking step and submerging regularly, it became a great test of how good or bad a shoe is for draining water. At this point the pace around me began to drop, as the a loose ascent came into view after the final crossing. Despite days of wet and overcast weather, the sun had broken out not long before the race started and sweat streamed. I took my glasses off, shaking them to avoid misting up, as hard breathing filled the air. As the top began to mellow out, running broke out again and as the first course split (for the short race), the route took a sharp right and a long decent opened up. Legs opening up, I was able to run past a couple of people. I really need to get my hamstring mobility improved! Free flowing, the only obstacles were sloppy mud ruts and obscure brown puddles. Keeping the guy in front within touching distance, I matched each move before making it to the first CP. Now, I have to admit, I did use a disposable cup. I was carrying a Hydrapak Speedcup, yet in the heat of the moment, grabbed a disposable cup in order not to loose time. (I should point out that Maverick Race are moving to being cupless throughout 2018. My actions weren’t exactly productive) Or, did I? I then spent what seemed like an age asking the marshal whether we were recycling cups, reusing or throwing away. In that same time I could have got the speed cup out, taken in some fluid, run off and put it away. Scurrying up the climb, the ruts on the narrow single track were similar to those on a tight mtb trail. You’ve two options, lock into it and ride it out, or avoid and slip ‘n’ slide around. If only I was happy to commit the same on a bike. I locked into the rut and drove my legs hard, as the descent began, until what would be the longest climb (if memory serves me correct) of the day. As the guy I was following pushed on with his long limbs (he was way taller), I opted for small steps, keeping my cadence high, much like climbing a road bike. He drew heavy breaths as I stayed clear of the red, making good progress, until I caught up with Bruce from inov-8. Easier to run sections greeted us, as mist rolling in from the sea and hills engulfed all, keeping the air cool and the running easier. I was glad to have been in the Lake District two weeks previously, running Legs 4 & 5 of the Bob Graham Round. The mountains in my legs made the hilly profile much easier to contend with, than had I kept to my usual training ground of Milton Keynes. At the final CP of the day, I produced my Speed Cup and realised it was in many ways more convenient then the prepared cup. No making sure I didn’t knock others over, no worrying about running off with it and having no where to dispose, plus it got me mentally thinking about the aid station as I approached. A swig and I was gone. Bouncing around the trail behind Bruce, a small rolling channel pinged us from side to side, following the path of least resistance, it was onto the gnarliest decent of the day. Enclosed by a canopy of trees, the harsh trail was awash with decaying organic matter, mud and an assortment of moving slick rocks. Commitment was the answer, steering momentum, rather than fighting it. This unrelenting section leveled out when we drew level with the water course, as feet meandered around the small inlets and channels, feeding the main stream. Unlike the Dark Series race, I hadn’t set out for guaranteed self destruction, emulating Zach Miller’s all out approach. I could talk, my energy levels were constant. I took on half a gel with 3 miles to go, as we ran as a pack, 3 of us pushing each other on. Joining the medium course, the tempo remained high, passing those in front, before we jumped onto the short course, for the final section and climb. I realised I needed to make a move. A move I should have attempted earlier on. Though I was working hard, there was a good level left in the tank. I’d paced well, but perhaps I was too well, too comfortable. This climb wasn’t the moment, had it already gone? As a trio, we navigated around the runners ahead, each with our own technique. Then Bruce led off ahead. I dropped back, a short walk, a rethink. The final marshal pointed down hill. Winding the legs up, the gradient increased, as did speed. Back onto the road, I remained reserved, knowing there was a mile or so to go. My abdominals were starting to lock up, I knew I was going into the red, but how much longer could I keep this up. The sounds of the event village were on my left, where is the turn in?! I was holding on, willing the finish to arrive and as I turned in, there was nothing more to give. Running up the drive and onto the finish straight, I couldn’t close the gap. 6th place / 111 Finishers. The Maverick Race inov-8 Original Somerset Long Course was brutal, as it was flowing, stunning, rapid, challenging and dare I say it……FUN! For an area of the country you don’t associate with hills, there had rarely been a moment to ran on flat land. Constantly throwing us up and down, on and off cambers, the course kept the mind engaged throughout and rewarded those who embraced it. Ben and Justin have created something special and that’s what I have come to love for their races. Putting on races in new areas, challenging all abilities and rewarding all ambition of runner. Each race has been very different, showing that to gain elevation and demanding trails, you don’t always need to head to the mountains. I’ve come away with a better understanding of pacing ascents/descents at race pace and how my engine currently is performing. Thank you Pyllon for your patience and persistence throughout the first third of the year and to the rest of #teampyllon for their support. Oh & the cake selection was next level.